As described in my December 30, 2008 post , the early Vanderbilt Cup Races were timed by scorers using stop-watches. This manual timing of the races was replaced by an electric timing system developed by Arthur and Charles Warner of Beloit, two brothers from Beloit, Wisconsin. In the early 1900s, drivers had no idea how fast or how far their cars were going. The Warner brothers filled this need with one of the first speedometers called an auto-meter. 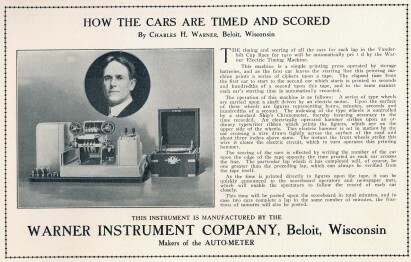 To help promote the auto-meter and expand their product line, the Warner Instrument Company developed the Warner Electric Timing Machine to time and score automobile races (see above image). The device was introduced in 1909 and was accurate to within 1/100ths of a second. The timer was activated by a steel wire hung a few inches above the ground across the Start-Finish Line . When a car ran over the wire, it triggered a printer that recorded the car's time on a paper tape. An operator then wrote the car number next to the time on the paper tape. The device was first used in a December 1909 race in Atlanta and then at the January 1910 Daytona-Ormond Beach Races.The system was introduced to the Vanderbilt Cup Races in 1910 and described in an article by Charles Warner "How the cars are timed and scored" highlighted in the official program guide. Warner's device system soon became the standard for timing automobile races including the 1911 Indianapolis 500 Race. Unfortunately, during this race, the steel wire across the track broke, forever complicating the determination of the winner of the Inaugural Indy 500 Race. The Warner brothers sold their company in 1912 for $1.2 million to Edgar Bassick. The company would eventually become the Stewart-Warner Company whose brands and timing devices are still sold today.